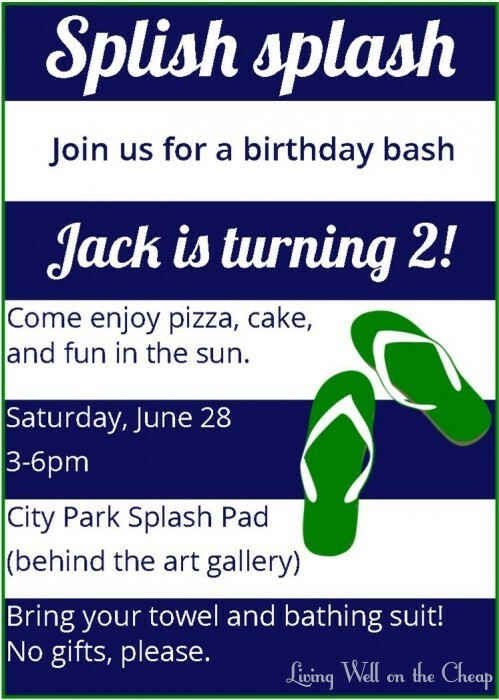 In celebration of Jack’s second birthday we had a small party at the splash pad near our house on Saturday. We kept the guest list much shorter this year and made things easy on ourselves by ordering pizza. 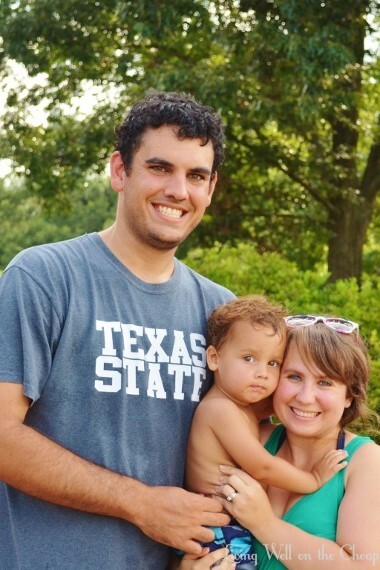 We considered having it at our house, but Jack loves visiting the splash pad so much that it was an obvious choice. 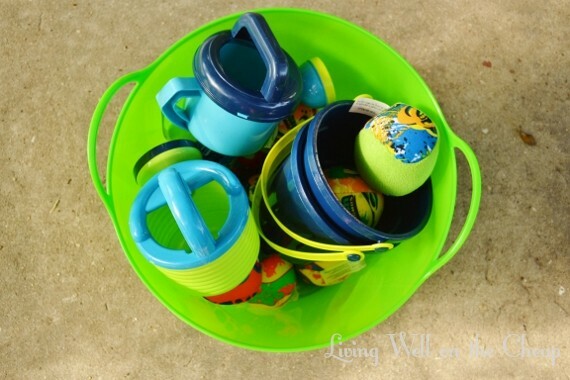 Getting everything to the splash pad and back home again posed a logistical challenge but it forced us to keep things low key and was still less stressful than hosting it at home. 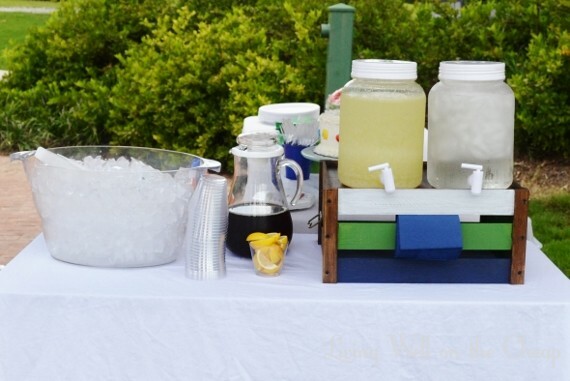 I filled some inexpensive beverage containers from Target with homemade lemonade and ice water–more on the beverage stand tomorrow. The iced tea was a last minute decision and the pitcher was only half full because I needed a spill-proof way to transport it and that amount filled the largest lidded jar that I had. I should have filled the pitcher with ice, the jar with water, and used the second beverage dispenser for tea. Live and learn. The tablecloth is just a twin sized flat sheet draped over a folding table. Although pizza was the main event, I also brought some fresh fruit and spinach dip. I didn’t have a shatterproof bowl large enough for the watermelon so I hollowed out the watermelon itself. I just took a small slice off the bottom to help it sit flat, then cut off the top third and cubed up the insides. Once I had most of the fruit removed I scraped out the rest to make a nice bowl. The tablecloth is a large canvas dropcloth that I already had. It’s been washed so many times that it’s amazingly soft. Everything on the table got squished over to the right once the pizza arrived. It’s also worth noting that we set up a folding canopy over the two tables–the cake was melting towards the end even in the shade! My sister is an amazing baker and did a great job with the cake. She knows I don’t like themed parties but couldn’t resist the temptation to incorporate one of Jack’s favorite things–Sesame Street. 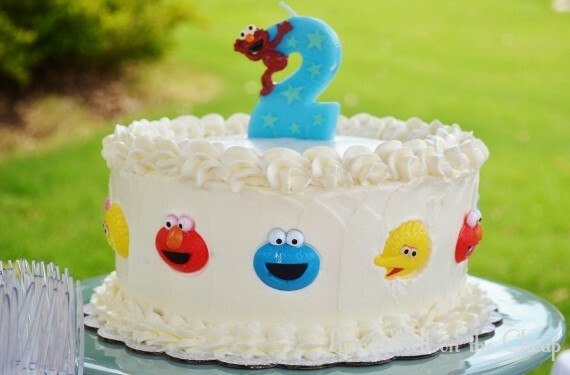 He LOVED seeing Elmo, Cookie Monster, and Big Bird on his cake. The characters around the perimeter are actually plastic rings. For older kids they could double as party favors but we set them aside after we saw Jack put one entirely into his mouth. 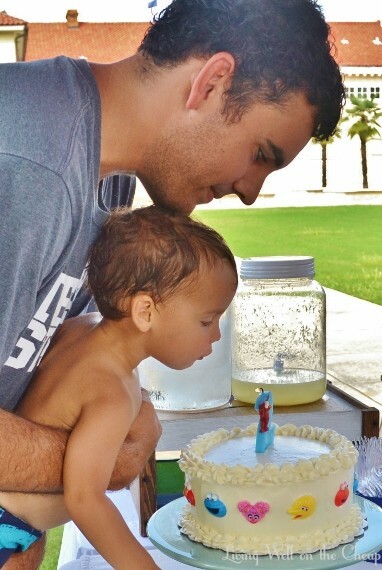 We’d practiced blowing out candles a few times recently so Jack knew what to do! He thinks it’s fun. The cake was strawberry with Swiss meringue buttercream icing–yum! Folks brought towels and folding chairs and sat down to eat wherever they felt comfortable. It was very relaxed. I didn’t manage to get a picture of it until after the party, but I spent about $20 on enough buckets, balls, etc. 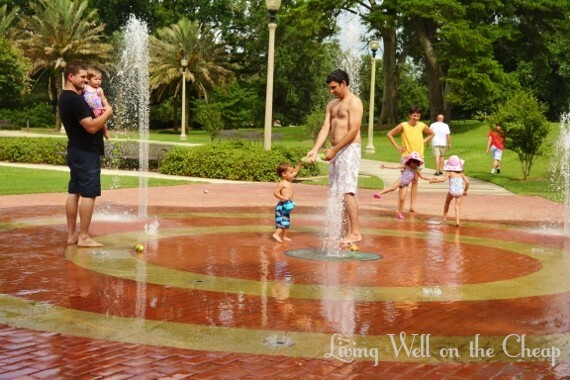 for all the kids to enjoy, plus any others that happened to be playing at the splash pad that day. 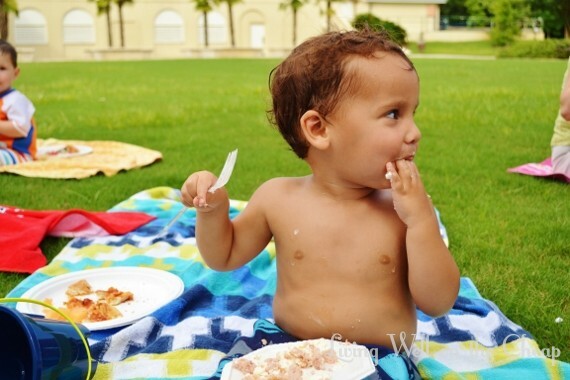 Normally it really bugs me when people bring toys to the playground or splash pad because my kid wants to play with them and it gets awkward, so I made sure to tell other parents that their kids were free to play with them and even bring them home. I intentionally bought a bunch because I figured they could double as favors and we still brought more home than we know what to do with. All together we spent right around $200, including $25 on a gift–Jack’s really into trucks right now so we got him this with some small things we knew he’d love, like bubbles and an Elmo cup, in the back. To save money I designed the invites myself and then emailed/texted them out instead of having them printed and mailed, bought napkins and cups at the dollar store, used things I already had whenever possible, and kept the guest list short–just kids we play with regularly and immediate family. I also found lots of things inexpensively in the Target dollar spot and summer sections and most of them are things I can use again for future parties. We probably could have saved quite a bit by serving homemade sandwiches instead of pizza, so that’s something to consider for next time. You can read about Jack’s first birthday party here. I’ve got to say that after this experience I’m pretty much sold on hosting parties away from home. An hour before the party we were just chilling on the couch, everything packed up and ready to go as soon as it was time. The only thing I didn’t plan well enough was the cleanup. I’d brought two small trash bins but they weren’t nearly big enough–next time I’ll bring a couple of large garbage bags to get everything home, including stuff like towels and tablecloths that aren’t getting thrown away but aren’t worth folding neatly for transport, either. I also forgot ice, even though I’d meant to buy a bag of it on our way over, but my sister’s teenage stepson saved the day by begging some from the golf pro shop adjacent to the splash pad. 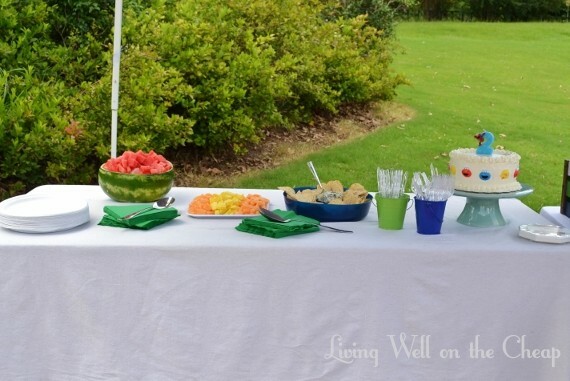 We are really lucky to have a place like this so close to home, but even if you don’t maybe you can repurpose some of the ideas used here–like sticking to simple colors instead of a theme so that you can be more flexible and reuse items in the future, or resisting the urge to invite everyone you know. It was so much more relaxed having a smaller crowd. We had such a good time that I wish we could do it again sooner than next year! I love this! What a refreshing change of pace to see a kid’s party on a blog without explosions of themed items and a cake that took 20 hours to make. We have way better things to do with our time than try to be the Martha’s (who were so exhausted after creating all their party stuff, they couldn’t hardly enjoy the party!) Happy birthday Jack! AMEN!I get that some mamas love to throw a big party but I definitely prefer to keep it simple.